Ready for Field Day 2011? If not, and you plan to participate, “Time’s a wasting.” Our June Members meeting will be at the clubhouse Friday at 7PM – that’s this Friday the 24th! Hope to see you there. Take Hwy 181 Southeast from Loop 410 towards Floresville. Palm Park is just outside of Loop 1604 on the right. We do plan to have a meal so bring a side dish please. Some of us will be there a few hours early to start some FD set‐up and your help will be appreciated if you can make it. A solar panel tray needs to be mounted at the base of our 3‐legged roof‐mounted tower, then wires run to the batteries. Once it and two people are on the roof it should go fast, maybe 30 minutes or less. It will mount with four U‐Bolts and the mount is ready and adjustable. Erik KD5YZU will site his “EGG” under the big tree we meet under and plans to stay overnight Friday and help with security. Saturday AM as early as helpers appear we’ll finish to be ready for the FD kick‐off at 18:00 ZULU/GMT/UTC; that’s 1:00 PM if you need a translation. If you’ll be operating, logging, or otherwise present during FD‐2011 please bring some chow and what you want to drink to keep cool. Some insect repellent might be handy, our main problem has been mosquitoes and flies. What works for flies? If your self‐confidence level still isn’t up to helping with an HF band activity, don’t stay away on that account. W5ROS is quite capable on 2M FM with a gain vertical up 80 feet and you can “do the do” there and work much of STX on SIMPLEX. If we get on 2M FM, W5ROS will “haunt” 146.54 SPX and scan around regularly. Let someone know ASAP if that’s your thing and we’ll reserve it for you. 73 and hope to see you Friday, Saturday and Sunday! 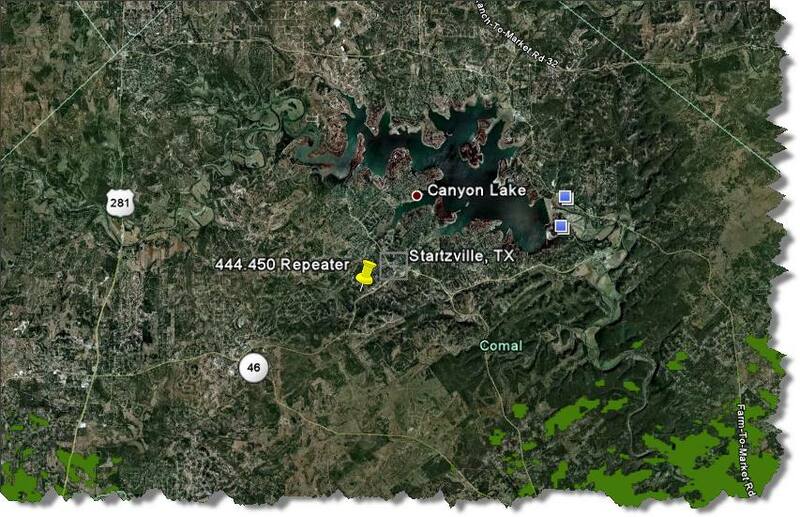 Hill Country REACT Team is the sponsor of a new Ham Radio Repeater in the Canyon Lake area. The repeater is located about a mile southwest of Startzville and the antenna is up at about 1670 feet above sea level. The antenna was measured as being about 390 feet up in the air on the tower, and the base of the tower is at 1280 feet above sea level. The repeater frequency is 444.450 mHz, positive offset, and with a 114.8 PL tone. The repeater is intended to be for open use by all hams. Testing has shown excellent coverage from north San Antonio up to south Austin, and all points between, using mobile radios. The Trustee is Wade W5ERX, currently the president of Hill Country REACT. He had the assistance of a couple other hams, including the newly appointed Comal County EC, Don Kirchner W5DK, and Gene Rowell WA5PAX, to build /prepare the repeater and finally install it at its new home. The repeater is a coordinated frequency with the Texas VHF-FM Society and tower hosting is being provided by BKT Towers. Oct 24, 1400Z-1900Z, Helena/Karnes County, TX. Radio Operators of South Texas, W5ROS. Historical Society’s Indian Summer Heritage Festivel. 14.265. Certificate. Andy Meyer, KD5TNI, PO Box 175, Hobson, TX 78117. Howdy Roosters, I submitted our Field Day report online to the ARRL yesterday evening. I will mail in our logs for our backup documentation. I bet we gave the Super Field Day folks a run for the money! That’s a helluva score, guys. You’ll notice under Club Name it says “None”: only clubs operating A, B, or F can operate under the club name – we were operating E. I don’t really understand the distinction. Field Day 2009 is nearly upon us, and preparations are underway to make this the largest, most successful Field Day event in San Antonio’s history. This is thanks to the participation of AARO, SARC, ROOST, SARO, Hill Country REACT, QCWA and many other organizations and individuals, operating jointly under the banner of Bexar County ARES. Field Day 2009 is expected to draw record numbers of operators and will feature many different bands and modes of operation, including PHONE, CW, SSB, PSK-31, FM and ATV as a Class “A” station. The total number of transmitters to be operated has yet to be determined, but will number at least six. History is in the making for San Antonio Hams in 2009. All of the major Ham Clubs in San Antonio appear to be reaching agreement in coordinating a single Field Day location rather than holding a half dozen separate locations as had been done in the past. AARO led the way, after losing their normal comfy spot over by the VA Hospital. They started the search for a new location, and thanks to our Ham Radio ties with the City of San Antonio, specifically our ties with the Fire Department, they found a new location to hold Field Day. The City Fire Department offered them the use of their Firefighters Training Academy, located west of the downtown area near Hwy 151 and Callaghan Road, as the site of their 2009 Field Day event.